With so many world-class golf resorts spread across the Algarve, it is tough to earn a reputation as one of the best, something Pestana Carvoeiro has achieved for many years. This awesome resort boasts five championship golf courses; Vale da Pinta, Gramacho, Silves, Alto and Vila Sol, and is the only resort in Europe to offer unlimited golf on 5 courses. Vale da Pinta and Gramacho are both on site and rank among the best courses in Portugal, the former hosted a European Tour Seniors event whilst the latter hosted an event on the Ladies European Tour. Vila Sol also hosted the Portuguese Open on 2 occasions. Found just 40-minutes from Faro Airport, not far from the glorious Algarve coast, Pestana Carvoeiro boasts a great golfing climate all year round. Some of Portugal’s most stunning beaches can be found just a short drive from the resort, as well as Carvoeiro, a charming nearby town that offers a host of bars and restaurants. The outstanding self-catered accommodation is both contemporary and airy, ideal for when you need a break from the Portuguese sun. Pestana Carvoeiro offers the chance to play some of Europe’s best courses in one of its most stunning locations, a great choice for any golf break. The Vale da Pinta is a fantastic parkland course, measuring 6,728 yards. Like the resort's further two courses, it was designed by Ron Fream, a highly regarded American golf architect, and features a number of lakes which are as testing as they are beautiful. Since opening in 1992, the course has established an excellent reputation, culminating with the award of a European Seniors Tour event in November 2007. The course places great importance on accurate shot making- tight fairways, doglegs, and many well placed hazards leave little margin for error. Perhaps the finest example of this can be found on the par 5 4th hole, measuring at 560 yards. The hole certainly provides a stern test of the driver, with a long and accurate drive towards a marker post, made tougher by the out of bounds on the left, and rough on the right. Further caution is required on the approach, with an ever narrowing fairway and a well protected, undulating green making for a tough par. Designer Fream was aided by multiple major-winner Nick Price in creating the Gramacho Course, the second at Carvoeiro. The Gramacho is unique in that it has 18 sets of tees, but has 27 greens, making for welcome variety. 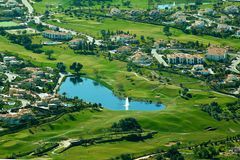 The 6,679 yard layout features many obstacles, including lakes, rocks and walls, as well as the almond, fig and olive tress that help to make the course so beautiful. The Gramacho has been selected to host the Ladies European Tour's finest players, and is a fascinating challenge. The 5th hole at Pestana Gramacho in the Western Algarve is considered by many to be a hidden gem, and is the perfect showcase for Pestana’s undulating fairways and slick greens. A dramatic driving hole, featuring an uphill fairway and a significant dogleg to the right. Just ten minutes away is the Silves Course, the third on offer for guests at the Carvoeiro resort. Silves is a typical resort course, with generous rolling fairways, and a number of large water hazards. Bordered by palm and olive trees, the course affords terrific views of the mountains and the valley. The main difficulty is the severity of the green-side bunkers, so accurate approach shots are crucial around this delightful Algarve track. The elevated tee shot to an immaculately manicured fairway forms a stunning view of a spectacular hole and requires a straight drive. Like most greens on the course, the 8th is very well protected and particularly fast. Situated in a stunning private community in the Western Algarve, Alto was the last course to be designed by the legendary Sir Henry Cotton. The winding fairways and elevated greens are typical of Cotton's architectural philosophy, and ensure that there is a stern challenge for the low handicap players, whilst remaining fair for the average golfer. Set across two rolling hills, visitors will enjoy beautiful views of the Lagos Bay. This short par 4 encapsulates many of the features typical of this course, including tight fairways, elevation changes and severe undulations around the green. The green on this hole is particularly small, with an uphill slope adding an extra club to the approach shot. The resort at Carvoeiro offers outstanding self-catered accommodation to golfers and non-golfers alike, and represents outstanding value for a terrific holiday in the sun-drenched Algarve. The accommodation consists of 115 apartments and 169 private villas which are spacious and modern, and are complete with all the necessary amenities to ensure that you will feel entirely comfortable during your stay. Notable features include full equipped kitchens, deluxe bathrooms, washing machine, central heating, direct dial telephone and satellite television. As the villas are individually owned, features will vary from villa to villa. All apartment guests are free to use a communal swimming pool, while larger groups and families in the villas will benefit from a private pool. The Carvoeiro resort not only owns five terrific golf courses - two of which are on site - but also boasts a fantastic range of sport and leisure facilities that make it such an outstanding holiday destination, with an option to suit every demand. Check in for the accommodation is at Gramacho Golf Clubhouse, not the reception at the top of the hill. A short drive from Carvoeiro you can visit some stunning beaches, typical of the Algarve's coastline, while inside the resort there are swimming pools, a football pitch, tennis and basketball courts, and a number of bowling greens. For something a bit more adventurous, there is a riding school in the local area, while the beaches are the place to try your hand at one of any number of hair-raising water sports. The well-equipped kitchens in the apartments and villas are perfect for the enthusiastic chef, but if cooking is not your forte, head for the nearby town of Carvoeiro, home to an array of bars and restaurants. The focal point of Carvoeiro is the old square, where you can find many charming restaurants and bars. For those seeking a little livelier evening can look to the bustling town of Albufeira which is just a 30 minute taxi away but closer to home there is the undiscovered Praia Da Rocha beach which is host to a number of bars, pubs and clubs all along one street. It's the ideal lively nightlife strip with pints as low as €3 and a glass of wine for €1.20! The perfect way to forget 3-putting the final hole. Excellent nothing to complain about, staff great, food and drinks great, service very good & rooms are fantastic ! Courses in superb condition. Staff extremely helpful. Will definitely return to same place next year! My Caddy Tip - Gramacho greens are the hardest of the 4 courses we played. The only thing that lets it down is the food and slow service. Golf was excellent and the courses great to play. Although not easy, the courses were very playable. They had a lot of caricature and were in good condition. My Caddy Tip - Stay on fairways as the ruff is thick. 19th hole will always be the best hole, which ever the course. Accommodation was first class, a 3 bed villa between the three of us overlooking Vale de Pinta. The courses were spectacular, we played Gramacho twice, Vale de Pinta once, Silves Twice and Vila Sol on our last day. Gramacho for me was a cut above the others, in fantastic condition, and a challenging course, with the par 3 10th possibly the nicest par three I have ever played. Vale de Pinta is much more elevated, and although I wouldn't recommend walking this course, it was a fantastic layout with some really memorable holes. Silves was the favourite of our other group members, it was in outstanding condition, the par 5 13th dogleg over water is without a doubt the nicest hole I have ever played. It was an easier test of golf compared to Gramacho and Vale de Pinta. As we had an evening flight we played Vila Sol on the way to the airport. the course was a little dry and much busier than the others, probably due to it being in Vilamoura. Overall, I would definitely recommend this to anybody, I have been to a few resorts in Spain such as La Cala and this place is a different class. I would recommend a car to get about though. My Caddy Tip - Use an iron off the first on Gramacho, the ditch at the end of the fairway is deceptivley closer than it looks! Also drive the 17th green if you have the distance, laying up before the water is difficult as everything slopes towards the water. The best course we played was Val de Pinta, but all are great courses and the staff were so polite and helpful. I would recommend to anyone. My Caddy Tip - Leave your driver out at villa sol and Alto unless you hit it straight. First visit in the New Year of 2013 was supposed to be a hotel B&B week but hotel was closed. We ended up with a one bedroom apartment overlooking the 18th at Gramacho with breakfast at the club included & self catering for the rest of the food. The apartment was well appointed & the local off course supermarket very reasonable. All the Pestana courses were in good condition. We booked again in the New Year of 2015 because we enjoyed 2013. There was a bit of a hassle to get a suitable apartment but the resort staff fixed the problem within a couple of days and we had another good week with excellent weather. Silves had matured and has some spectacular elevated tees. Service was exceptional at the course and the villa was above expectations. My Caddy Tip - If dry the ball runs well. Great breakfast. Buggies were a bit pricey. No consistency in prices from one clubhouse to another. Close to 3 premier resorts for apres golf. My Caddy Tip - Need all your clubs. Going back again next year and can't wait. Gramacho easiest of five courses, Vila Sol the toughest..
Gramacho was my favourite as I Broke Par for the first time ever, shooting 69 Gross! My Caddy Tip - Greens fast and true. Greens can be fast and if windy keep to low irons. My Caddy Tip - Keep to the right on the 17th hole on Gramacho. Safety shots can still end up in the pond. Gramacho hole 10 and Pinto hole 13 were the stand out holes. The apartment was clean and spacious and the staff were very helpful. Really enjoyable break. Would definitely go back. All good, there's too much for me to say really. Have booked again. Great choice of championship courses. Accommodation was very nice. Best value golf resort in the Algarve, our 4th year planned. My Caddy Tip - Bring the sun cream. Accommodation in self catering on the course was great.